Donald C. Saylor achieved his dream of owing his own grocery store in 1977 when he opened Saylor's Market. When he opened the store it initially was 6,000 square feet and employed 23 workers. 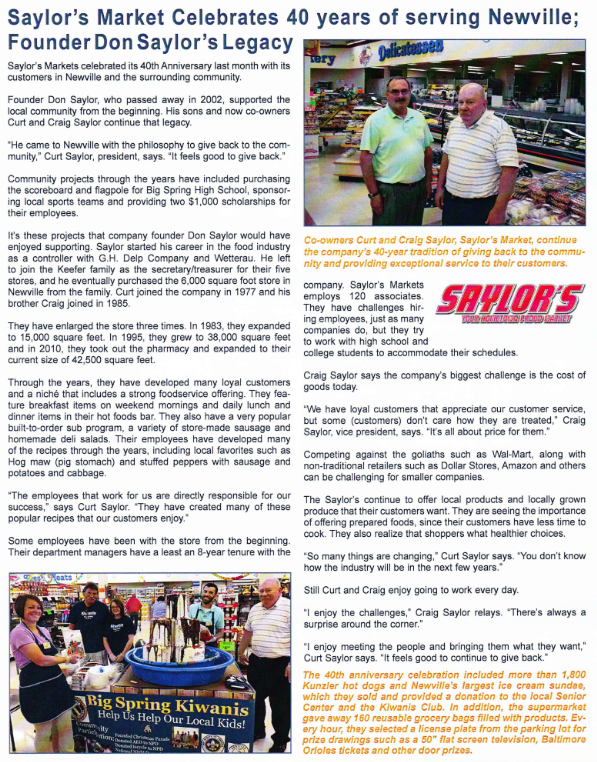 Saylor's expanded in 1983 and in 1994 with brought the store to 42,000 square feet with more than 100 employees. For the first few years Don had run the business by himself. Soon after his two sons Curt and Craig learned all aspects of the grocery business and joined the team. Through out the years many of Curt and Craig's children have also worked to the store and continue to do so. Saylor's market is closed for all major holidays so the employees can spend them with their families, which was important to Don. Unfortunately on February 19, 2002 he passed away. His sons continue to run the business the way Don has always wanted it to be done. His philosophy was to put the customer first and to be good to the employees. Even with 10+ years down the road they continue run their fathers dream the way he would have wanted it done. Saylor's continues to donate to many school and local non-profit organizations and lets community groups hold fundraisers in front of the store. Curt and Craig will continue to run the store on the foundation that it was built on.